The Black Hawk DockDogs & Common Woof Games pool once again WOWed visitors with exciting Dog entertainment & competition from a wide range of breeds launching off a dock into a massive pool of water! One of the most popular attractions at the Dog Lovers Show the Black Hawk DockDogs® once again WOWed visitors in 2018. 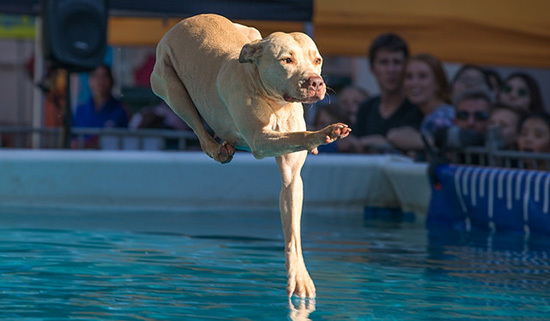 The adrenaline fuelling DockDogs® comprised of Dogs jumping into a custom built pool of water. The DockDogs® Australia National Competition had a number of different competitions. Big Air® was a “long jump for dogs”. The dog, which may be placed anywhere on the 40′ dock, ran and jumped into the water after a throw toy (provided by the handler) was tossed. The distance was judged from the end of the dock to where the tail set of the dog broke the water’s surface. Rapid Relay was an exciting battle of teams that encompassed a traditional relay challenge between dogs. Speed Retrieve® was a “timed event”. At the far end of the pool a bumper toy was suspended above the water with a starting indicator above it. The dog was then positioned at the start line on the dock; when the light turned green the handler released the dog. The time clock stops ticking when the dog pulled the toy from the Speed Retrieve® bracket. Extreme Vertical® was a “high jump” for dogs. The dog started off at the 20’ mark on the dock & jumped up to grab a bumper toy extended from the end of the dock over the water. Big Air is a “long jump for dogs”. The dog, which may be placed anywhere on the 40′ dock, runs and jumps into the water after a throw toy (provided by the handler) is tossed. The distance is judged from the end of the dock to where the tail set of the dog breaks the water’s surface. Triple Jump is a “long jump for dogs”. The dog, which may be placed anywhere on the 40′ dock, runs and jumps into the water after a throw toy (provided by the handler) is tossed. The distance is judged from the end of the dock to where the tail set of the dog breaks the water’s surface. Extreme vertical is a “high jump” for dogs. The dog starts off at the 20’ mark on the dock & jumps up to grab a bumper toy extended from the end of the dock over the water. Rapid Relay is an exciting battle of teams that encompasses a traditional relay challenge between dogs. A high energy speed retrieve between two Dogs as they run down the dock, jump into the water, swim to the end of the pool and retrieve an object!